The baked goods and ice cream here at FroRoll are all made in-house daily to ensure consistency, freshness and the highest quality desserts. 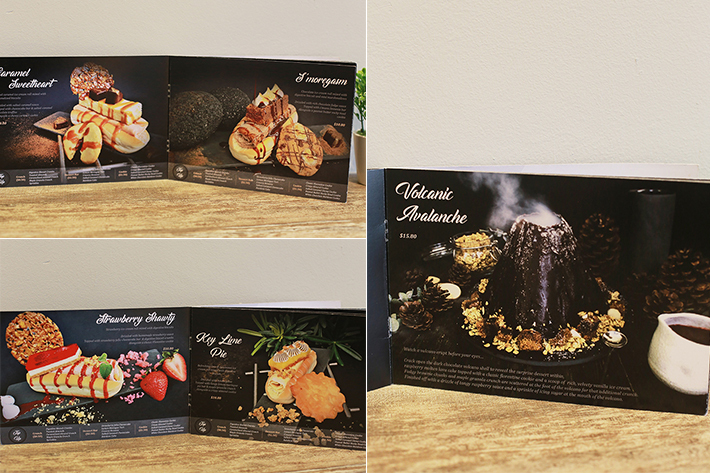 An interesting fact to know is that this imaginative dessert joint is opened by Campus Superstar alumni, Keely Wee. The cafe features an open concept whereby guests can feel free to stand and watch as their desserts are put together by the friendly staff. If you are looking for something a little less than usual, flip through the menu of elaborate creations and you will stumble upon something called the Volcanic Avalanche (S$15.80)—which is essentially a raspberry molten lava cake hidden within a volcano of dark chocolate, drizzled with raspberry sauce and surrounded by bits of brownie and crunchy toasted bread sprinkled at the side. 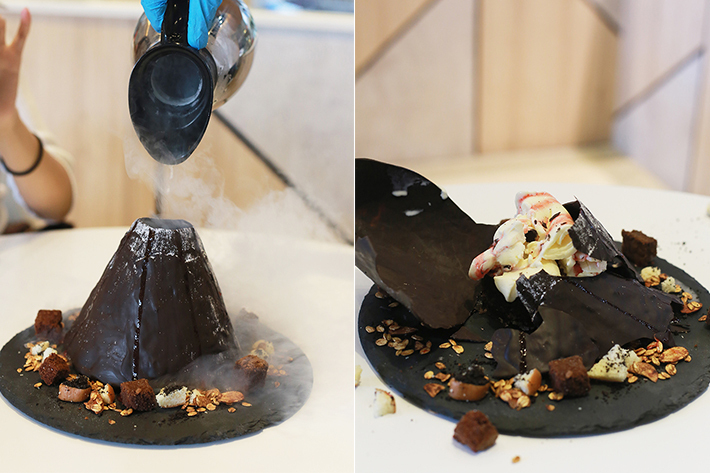 Upon serving, liquid nitrogen is poured over the ‘volcano’ for theatric effect and to spark some initial excitement—don’t forget to snap a video of the process for the gram! On the other end of the taste spectrum, go for something like the Key Lime Pie (S$10.80) which is a much tarter alternative to their other dessert offerings. A fairly generous dollop of lime and calamansi ice cream sits atop a hot dog bun and is finished off with a mini key lime cake and a drizzle of a citrusy syrup. The nut brittle that comes with it adds a nice crunch and a subtle savoury element that balances out the sourness really well.